During my first spring here, I came across agretti. I cooked it in boiling water for only a couple of minutes and served it dressed with just olive oil and lemon juice. Afterwards, I kept my eye out for it, but it only seems to be around for a very short time. Then, early last year on a trip back to the UK, I saw a whole article on it in a newspaper. I learnt that it was called Monk’s Beard in English and I saw a recipe for pickling it. The recipe looked enticingly easy and only had two ingredients: agretti and white wine vinegar. As airlines are cracking down on luggage weight and as my bag was already up to its limit, I only tore out the tiny piece with the pickling recipe. 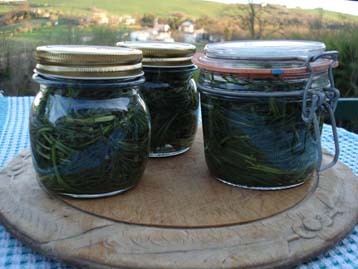 1) Prepared the agretti by removing the tough stalks, washing it and patting it dry. 2) Packed it into sterilised jars. 3) Topped the jars up with white wine vinegar. I bought the agretti yesterday at the market in Apiro on a very sunny Palm Sunday. Everyone was going about their usual business, but with an olive branch in hand. Just recently, Rowena at ‘Rubber Slippers in Italy’ introduced me to another spring green: Catalogna Spigata. There it was, right next to the agretti. I would have missed it completely had it not been for her post. Now I can try her recipe for Punterelle alla Romana. This is something I can’t find here, but would love to try. I guess I will have to locate a source for seed and grow it myself. Funny that you should mention the puntarelle because that is what we had as a contorno for dinner tonight! I like what you’ve done with the agretti. They’ve been on the market shelves here but this year I don’t have the gumption to do much more than ‘look’. Certainly, I do not mind the mentioning of links (thank you!). Actually I’m a fiend when it comes to linking to where I find my cooking info but unfortunately, since most of the food forums that I hang out at are in italian, I fear that much of it would be lost on english-speaking readers. Very informative. Thanks for sharing. I have made this dish several times in Italy. 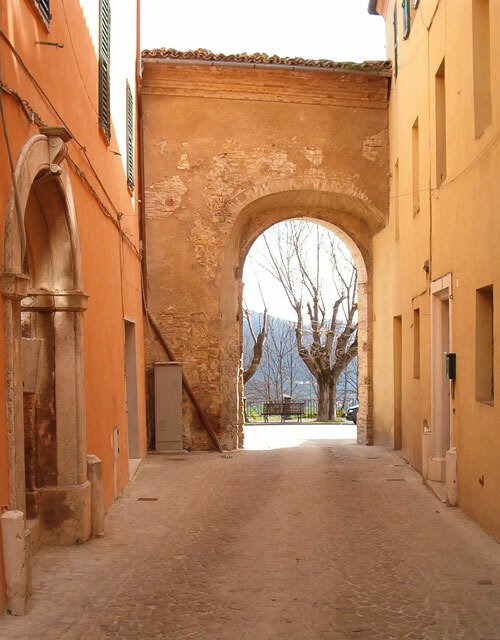 It is much more common in the Lazio Region than in Abruzzo where I spend most of my time. Hey there, I keep seeing this wonderful looking ‘weed’ at the market and haven’t tried it yet. It looks a bit like samphire, a kind of edible suculent that grows on rocks near the sea, we used to collect it when we were kids on the North Norfolk coast, my dad simmered it briefly and we ate it hot and salty with lots of butter. Really enjoying your blog, have added you to my links. i was wondering, by pickling in pure vinegar, wasn’t it a little heavy on the vinegar side rather than showing any of the agretti flavour? Hello, Yes, it is heavy on the vinegar. More of a condiment really. Not sure I’ll do this again as the agretti is better fresh – I like it dressed with just a squeeze of fresh lemon juice and a little olive oil. I think this is just a way of preserving it.